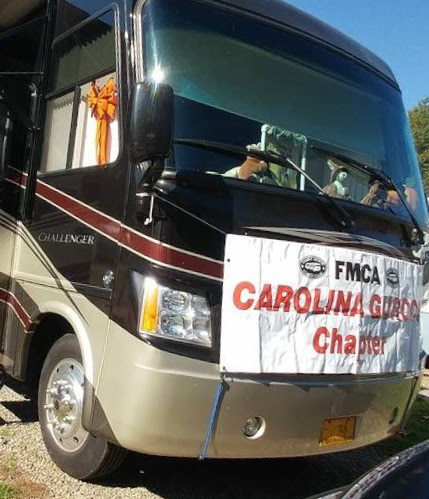 Fun at an FMCA Chapter Rally – Let's Go RVing! In July Jerry and I were in Indianapolis at the FMCA National Rally where we met a lovely couple from North Carolina. Since they were parked right behind us we ran into them frequently which led to evening visits and an enjoyable way to wind down after our busy days. They shared their involvement with one of the North Carolina chapters, the Carolina Guroos. After we got home we got an e-mail from the chapter president asking us if we were interested in joining and or attending a rally. We immediately decided to join and to attend the October rally in Waynesville, NC. We arrived on Wednesday at Creekwood Campground and after setting up began to immediately meet members of the Carolina Guroos. After a short afternoon of visiting seven of us went out to eat at Maggie’s Galley. I had rainbow trout which was delicious but of course Jerry had to try something a bit different. He had gator tail. He thought it would be a large piece of gator but instead it resembled the gator bites we’d had several years ago. Actually it looked like fried oysters to me but he said they were good. Thursday was another afternoon of visiting with everyone trying to escape the warm sun and sit in the shade. Jerry finally got out our NC State tent and we spent the afternoon there. People came and went bringing chairs and sometimes beverages with them. It was a great afternoon. Thursday evening we all gathered at the meeting room for barbecue and then games. Our game that night was Left, Right and Center. It was a fun game. Friday morning we made our one trip out of the campground to go to the grocery store. Jerry had heard from one of the other members about a wood distributor close to the campground. That definitely peaked his interest so after the grocery store run we headed to Oak Unlimited. Jerry went in to talk with the owner to see what they had available for sale. They had ends for $2.00 a piece so Jerry decided to get five. When the fellow asked Jerry what kind of wood work he did Jerry brought him out to the car to see the walking sticks we had been lugging around. The fellow asked if Jerry sold them and if so for how much. When Jerry responded $20 the guy’s response was “take 10 pieces of wood and give me a walking stick and we’ll call it even”. Needless to say that put a big smile on Jerry’s face. Another afternoon of visiting and then everyone went out to eat at Rendevous Restaurant. Because it was leaf peeping season it was difficult to find a restaurant that would take a reservation for 20 people so our choices were limited. After we returned to the campground we joined the couple across from us at their campfire. 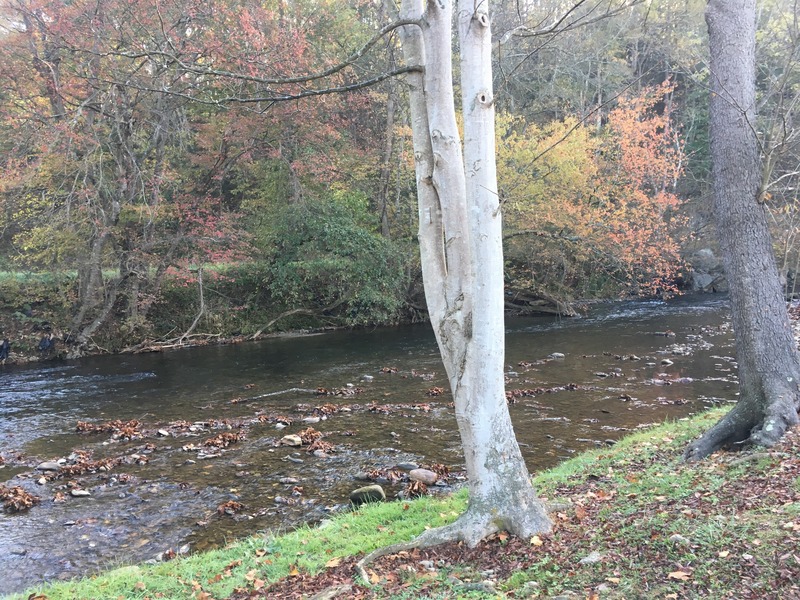 Several couples sat out by the creekside in the cold (cold enough for me to have a blanket) and listened to jokes and I’m quite sure a few “fish stories”. Every RVer has an interesting anecdote or experience to share. Around the campfire in the flickering light most are funny but some have a lesson behind them. For example, don’t go through a yellow caution light when towing your car behind your RV. The car will go through on the red light and yes, the camera will get a picture. Upon returning home you mayfind a ticket waiting in your mailbox! True story. Saturday afternoon a couple of the guys were carving pumpkins for the pumpkin contest later in the evening. The ladies all joined to watch our president show us how to tie dye a small pumpkin with nail polish. That was very simple with a lovely outcome. Definitely something to try with the grands! Update: I tried it the next week with the grands – colossal fail! Instead of going out to dinner Saturday night we all gathered in the meeting room for pizza and salad. After that we played Five Seconds. Dividing up into teams of two, men against women we were asked a question that had 3 answers and 5 seconds to answer. There was so much laughter that at times it was difficult to even hear the answers! Saturday evening concluded with another campfire. It was a little warmer so no blanket was necessary. The rally concluded Sunday morning with biscuits from Bojangles and a devotion by Sandy who along with her husband Rick was the wagon master for the week-end. They did a great job, one usually done by two couples and set the bar high for the next week-end rally. The Christmas party will be lunch in Clemmons in December and then Florida in February. We are planning to attend the lunch in Clemmons but will have to see if Florida works in our plans. After a fun filled week-end with great people I can truthfully say joining Carolina Guroos was one of our better decisions. I have often described us as “travelers” rather than “campers” but this week-end we were campers! Traveling and touring as we do means we often leave the campground early in the morning and return late in the afternoon collapsing from fatigue. That doesn’t give much time to enjoy the camaraderie of the other travelers/campers in the campground so this was an even more special time. The only time we left the campground was to go to the grocery store and a short stop at Oak Unlimited. Otherwise we slept in, had lazy mornings and evening campfires, played fun games filled with laughter with new friends and did a lot of visiting. Can’t wait to get together again! Now on our way to Williamsburg for the Newmar Kountry Klub Region 5 Rally!